It had been prophesized in the Manjushri Root Tantra by Buddha Shakyamuni that he would be reborn as a child who would carry out the deeds of Buddha and would found a great monastery. Accordingly, in the 14th century, Je Tsongkhapa Lobsang Dragpa the great King of Dharma also known as Je Rinpoche founded the Ganden Namgyaling Monastery. After the King of Dharma Je Tsongkhapa had founded Ganden Monastery; it became his main seat. 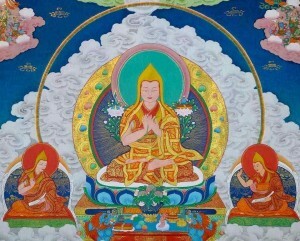 Je Tsongkhapa’s close disciple Jamyang Choje Tashi Palden founded Drepung Monastery in 1416. Sera Monastery was founded in 1419 by Je Tsongkhapas’s other disciple Jamchen Chöje Shakya Yeshe and the 1st Dalai Lama Gendun Druppa founded Tashilhunpo Monastery. Many Gelug monasteries were built not just in Tibet but also in China and Mongolia. The great monasteries of Ganden, Drepung and Sera became the three prominent monastic universities in Tibet. For centuries, the Gelug school was the religious and political authority in Tibet and had remained so until the mid 1950s. In the West, the Gelugpa School is the best known among the four schools of Tibetan Buddhism (Gelug, Sakya, Kagyu and Nyingma) and is associated with the Dalai Lama and the Panchen Lama. Before passing into Parinirvana, Je Tsongkhapa the founder of the Ganden Monastery and the Gelug tradition passed on his robe and ritual items to his heart son Gyaltsab Je who assumed the role of the Ganden Tripa (the holder of the golden throne of Ganden). Gyaltsab Je then passed on his robes and ritual items onto Khedrub Je who became the next Ganden Tripa. Till this day, the holy unbroken lineage of Ganden Tripas (throne holders) represents the King of Dharma Je Tsongkhapa on earth. The current throne holder is His Holiness the 104th Ganden Tripa Jetsun Lobsang Tenzin Rinpoche. His Holiness the Ganden Tripa is the supreme head of the Gelugpa tradition. It is often misunderstood that the Dalai Lama is the head of the Gelugpa tradition of Tibetan Buddhism. The Ganden Tripas were not just spiritual heads of the Gelugpa school, but they were often tutors to the Dalai Lamas and the Panchen Lamas and also acted as Regents of Tibet in the absence of the Dalai Lama. His Holiness the Ganden Tripa is also known as the Ganden Tri Rinpoche or Trichen Rinpoche. The seat of Ganden Tripa is an elected position held for a period of seven years. It is awarded based on merit and only the best Buddhist scholars and practitioners can ascend the golden throne of Ganden as the Ganden Tripa.